Extra Thin, Extra Light- Only 0.8mm Thin Glass, 10g Feather Light Filter - Zeta EX uses a specially polished 4 layer thin glass and ultra thin frame combination making it wide-angle lens compatible. Even with being this thin, the Zeta EX still has the front screw on function for attaching a lens cap. The super light weight mechanically benefits certain AF lenses. Extra Bright - High Transparency Polarizing Film - Zeta EX transmits as much as 25% more light through the polarizing film, giving the photographer about 1 stop more light than a standard circular polarizer. Extra Anti-Reflective - ZR ( Zero Reflection ) Super Multi-Coating - Newly designed innovative ZR (Anti-reflective) coating makes reflection rate less than 0.3% of single surface of the glass (Less than 0.6% with Wide Band C-PL). ZR coating also creates Water Repellent and Scratch Resistant glass surface to make filter maintenance very easy. Extra Smooth Glass - Nano Glass Technology - Our Nano Glass Technology creates an ultra smooth surface from the finest particles of glass, making it stain and scratch resistant without any effect to the image. Ultimate Color Enhancement: C-PL filters allow you to remove unwanted reflections from non-metallic surfaces such as water, glass etc. They also enable colors to become more saturated and appear clearer with better contrast. This effect is often used to increase the contrast and saturation in blue skies and white clouds. Kenko's C-PL filter do not affect the overall color balance of a shot. 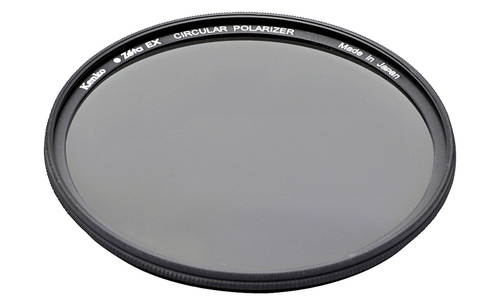 The worlds thinest, lightest circular polarizer ever! Zeta EX uses a specially polished 4 layer thin glass and ultra thin frame combination making it wide-angle lens compatible. Even with being this thin, the Zeta EX still has the front screw on function for attaching a lens cap. The super light weight mechanically benefits certain AF lenses. Zeta EX transmits as much as 25% more light through the polarizing film, giving the photographer about 1 stop more light than a standard circular polarizer. This innovative coating will not interfere with any color or light transmission. Reflections are eliminated by allowing light to enter the filter at virtually any angle. Our Nano Glass Technology creates an ultra smooth surface from the finest particles of glass, making it stain and scratch resistant without any effect to the image. The Kenko Zeta EX filter with 'ZR Anti Reflective Coating' is the ultimate filter for use with Digital Single Lens Reflex Cameras. Newly designed innovative ZR (Anti-reflective) coating makes reflection rate less than 0.3% of single surface of the glass (Less than 0.6% with Wide Band C-PL). ZR coating also creates Water Repellent and Scratch Resistant glass surface to make filter maintenance very easy. Human injury or material damage may occur if filter is used mistakenly because instructions are not observed. Do not drop or impact filters. If glass breaks, do not touch it with bare hands, as doing so may cause injury. Moreover, filter frame may become misshapen, and unattachable to lens. Do not leave filter in direct sunlight or hot & humid locations, as doing so may discolor filter, which will prevent desired effect. Be sure to properly attach filter to lens. Failure to do so may mean that the filter will detach and fall from the lens, which will damage the filter thread. There are some specialist wide-angle lenses that have extremely protruding front eye centers. Attaching a filter to such a lens may cause contact between filter and lens, possibly scratching the lens, so be sure to carefully check the gap between the filter and lens while attaching the filter. Be sure to become fully acquainted with filter effects prior to taking photographs. The Circular Polarizing (PL) filter works to eliminate reflection from water and glass surfaces but also aids color contrast to deepen the color of blue skies and give vividness to trees, mountain faces and buildings. The Circular PL filter has a dual structure with a rear frame section that is secured to the lens and a front frame section that rotates 360 degrees. If it is attached to the lens, and the front frame section rotated, reflection will be eliminated and the interior of the viewfinder will darken. The darkest point is the position providing the greatest effect. Therefore, adjust this filter until you find the effect that best suits the image you want to photograph. As the quantity of transmitting light changes with the rotated position of this filter, the exposure factor will change by approximately 1.7 to 2.2 fold (0.7 to 1 stops), but with TTL photometry, photos can be taken with the photometry reading just as it is. When the filter is attached to a lens with a rotating front frame, focus the camera, and then rotate the filter. The C-PL filter eliminates reflections from surfaces like water, glass, and the floors and walls of buildings, as well as emphasizing the shape, the material feel and color of objects. Best results can be achieved by photographing from a position at an angle 30 to 40 degrees from the plane surface of the subject. This filter cannot counter reflection of photographs taken right in front of subject (90-degree shots) or metallic reflection. For photos of fresh verdure, autumn leaves and buildings, etc. that have a blue sky in the background, this filter deepens the blue sky to create a contrast with the foreground, which gives colors vividness. To do this, the position of the photographer in relation to the sun is important. The effect works best in the directions (plane) orthogonal to the direction passing through the sun and the photographer against the sun (front light). This effect also works very well in the vicinity of land and water horizons during the daytime and overhead at sundown. However, the effect is only minimal when photos are being taken into the sun (backlight) or the weather is cloudy. Even if the Circular PL filter is attached, the effect cannot be confirmed at the finder. Therefore, prior to attaching, rotate the filter directly in front of your eyes to adjust it to an effect position that suits the image you are aiming for. At this time, take note of the arrow mark position, then attach filter, and adjust the arrow mark to the angle you took note of. Do not leave filter in direct sunlight, as doing so for even a short length of time will change the filterfs characteristics. Moreover, be careful about storage of filter, taking care not to leave it in very hot locations (60 or higher). The polarizing film on the surface of filter glass which creates polarizing effect will be discolored with the frequency of filter usage. We recommend you to buy new one after using around 7 years. To clean off dirt from glass, add a small amount of lens cleaner to a lens cloth or lens paper, and wipe the lens as if drawing a circle. When glass is clean, wipe it dry with lens cloth, making sure that no lens cleaner remains on the glass. When filter is not in use, place it in supplied case, and store away from direct sunlight, and very hot and humid locations.